Buried piping at some nuclear power plants has degraded to the point that through wall leakage has occurred. In a few cases this has led to releases of tritium into groundwater, which has generated significant stakeholder interest. Leaks from degraded buried piping are responsible for less than approximately 10-20% of recently reported abnormal releases of tritium from nuclear power plants. 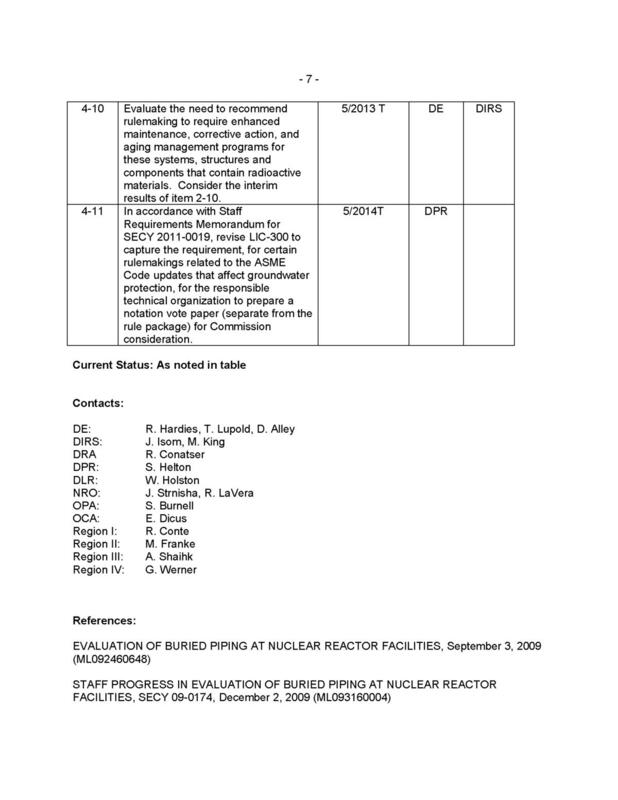 The Nuclear Regulatory Commission (NRC) staff, in SECY 09-0174 (ML093160004), reviewed codes, standards, regulations and industry practices related to degradation of buried piping and identified a number of ongoing activities. This action plan tracks those activities. Leaks from buried piping, particularly of tritiated water, have attracted significant stakeholder attention. For example, during 2009 buried piping leaks introduced water that contained low levels of tritium into the groundwater at Dresden, Oyster Creek and Peach Bottom nuclear plants. The levels of tritium did not exceed any NRC limits (that would be applicable on-site), and after additional dilution and decay that would occur as a natural consequence of migration toward the site boundary, would not exceed any NRC limit offsite. 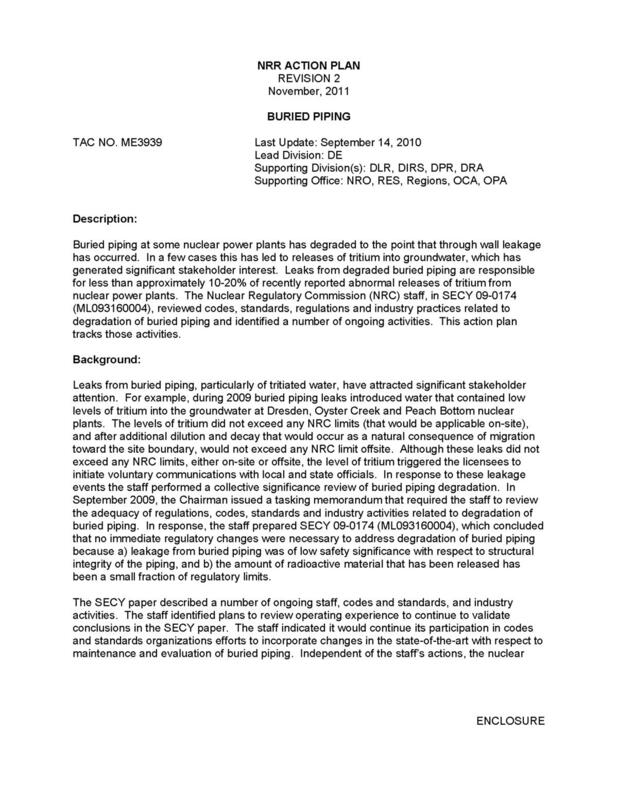 Although these leaks did not exceed any NRC limits, either on-site or offsite, the level of tritium triggered the licensees to initiate voluntary communications with local and state officials. In response to these leakage events the staff performed a collective significance review of buried piping degradation. 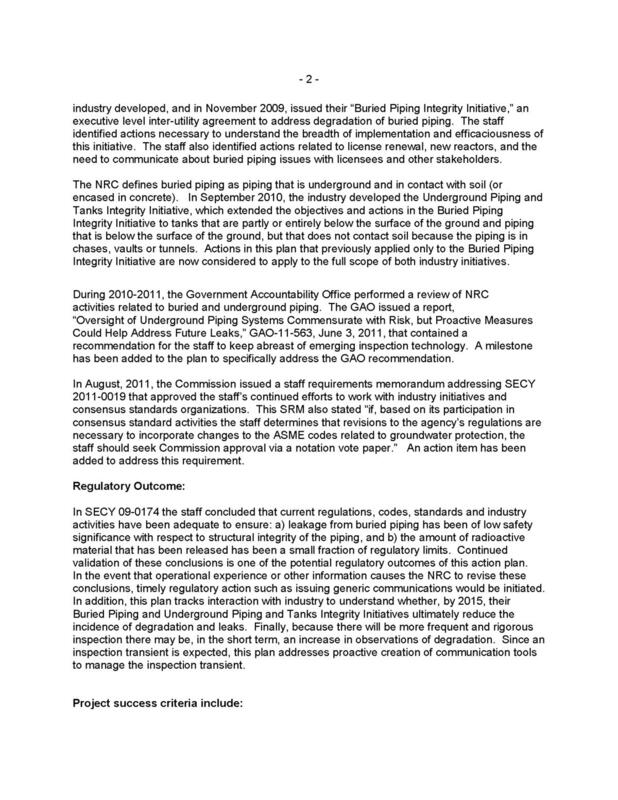 In September 2009, the Chairman issued a tasking memorandum that required the staff to review the adequacy of regulations, codes, standards and industry activities related to degradation of buried piping. b) the amount of radioactive material that has been released has been a small fraction of regulatory limits. 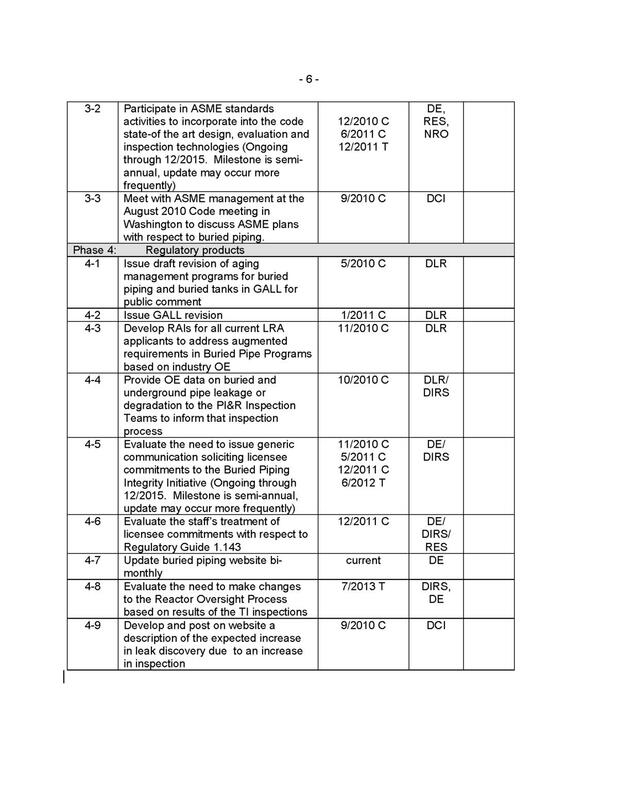 The SECY paper described a number of ongoing staff, codes and standards, and industry activities. The staff identified plans to review operating experience to continue to validate conclusions in the SECY paper. The staff indicated it would continue its participation in codes and standards organizations efforts to incorporate changes in the state-of-the-art with respect to maintenance and evaluation of buried piping. executive level inter-utility agreement to address degradation of buried piping. The staff identified actions necessary to understand the breadth of implementation and efficaciousness of this initiative. The staff also identified actions related to license renewal, new reactors, and the need to communicate about buried piping issues with licensees and other stakeholders. The NRC defines buried piping as piping that is underground and in contact with soil (or encased in concrete). 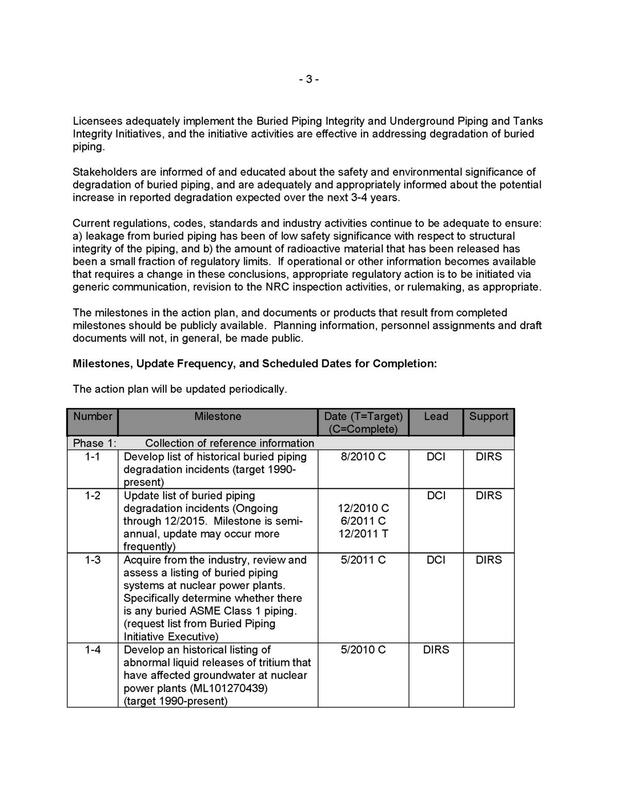 In September 2010, the industry developed the Underground Piping and Tanks Integrity Initiative, which extended the objectives and actions in the Buried Piping Integrity Initiative to tanks that are partly or entirely below the surface of the ground and piping that is below the surface of the ground, but that does not contact soil because the piping is in chases, vaults or tunnels. 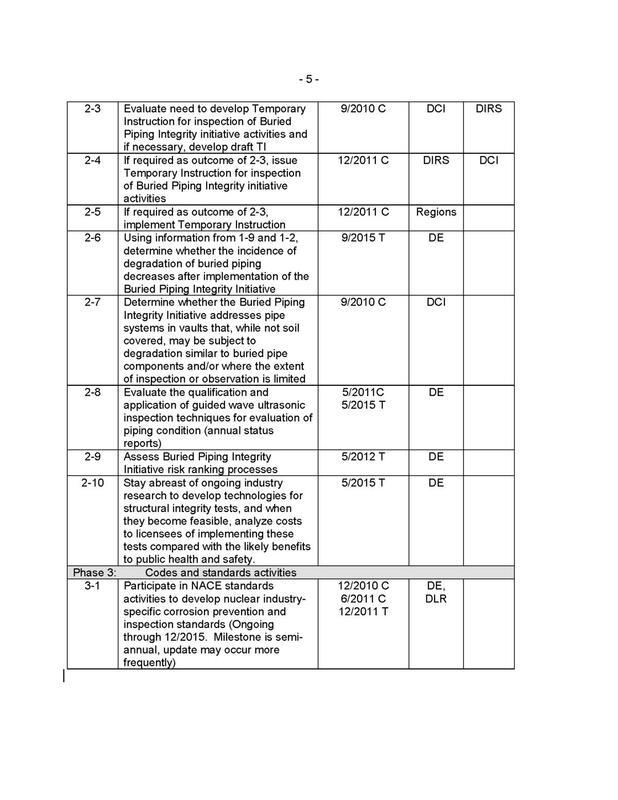 Actions in this plan that previously applied only to the Buried Piping Integrity Initiative are now considered to apply to the full scope of both industry initiatives. During 2010-2011, the Government Accountability Office performed a review of NRC activities related to buried and underground piping. The GAO issued a report, “Oversight of Underground Piping Systems Commensurate with Risk, but Proactive Measures Could Help Address Future Leaks,” GAO-11-563, June 3, 2011, that contained a recommendation for the staff to keep abreast of emerging inspection technology. A milestone has been added to the plan to specifically address the GAO recommendation. An action item has been added to address this requirement. 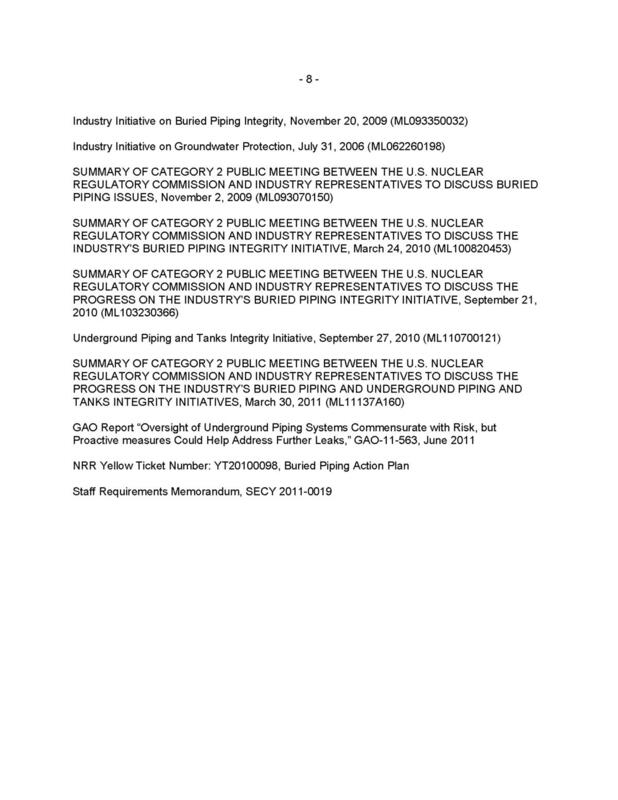 In SECY 09-0174 the staff concluded that current regulations, codes, standards and industry activities have been adequate to ensure: a) leakage from buried piping has been of low safety significance with respect to structural integrity of the piping, and b) the amount of radioactive material that has been released has been a small fraction of regulatory limits. Continued validation of these conclusions is one of the potential regulatory outcomes of this action plan. In the event that operational experience or other information causes the NRC to revise these conclusions, timely regulatory action such as issuing generic communications would be initiated. In addition, this plan tracks interaction with industry to understand whether, by 2015, their Buried Piping and Underground Piping and Tanks Integrity Initiatives ultimately reduce the incidence of degradation and leaks. Finally, because there will be more frequent and rigorous inspection there may be, in the short term, an increase in observations of degradation. Since an inspection transient is expected, this plan addresses proactive creation of communication tools to manage the inspection transient. Licensees adequately implement the Buried Piping Integrity and Underground Piping and Tanks Integrity Initiatives, and the initiative activities are effective in addressing degradation of buried piping. Stakeholders are informed of and educated about the safety and environmental significance of degradation of buried piping, and are adequately and appropriately informed about the potential increase in reported degradation expected over the next 3-4 years. 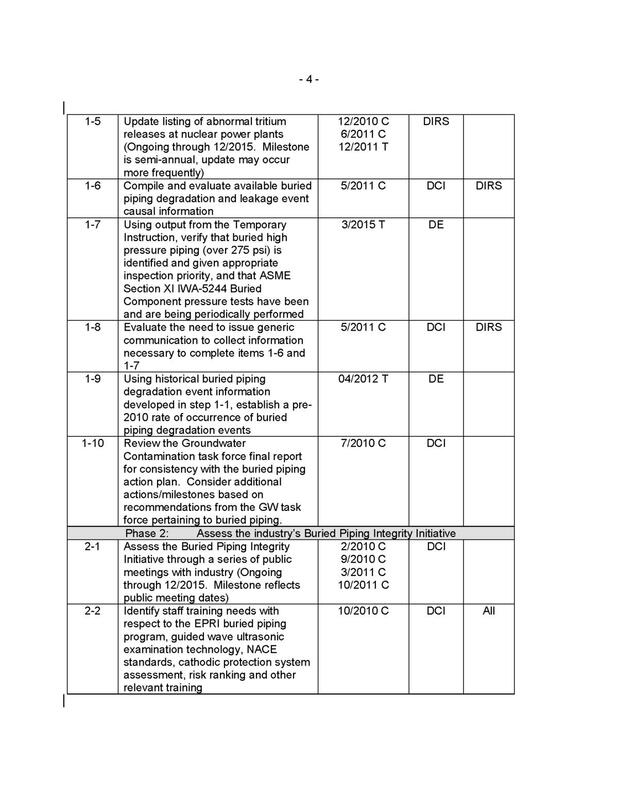 generic communication, revision to the NRC inspection activities, or rulemaking, as appropriate. The milestones in the action plan, and documents or products that result from completed milestones should be publicly available. Planning information, personnel assignments and draft documents will not, in general, be made public.